Alec was quite adamant that he needed to make a cake for our family cookout this weekend. He knew he wanted a plain vanilla cake with vanilla frosting but he really wanted to focus on cake decorating. He has decorated a few cakes and cupcakes but this was his first time using melted chocolate and I think he did an excellent job! He spent the afternoon on Thursday baking up a vanilla cake recipe that he found on Pinterest. Once it was cooled he mixed up a batch of vanilla buttercream frosting and smoothed a layer of frosting over the whole cake. He set the cake aside and turned to his decorations. We drew a large circle on a sheet of paper; the same size as our cake top. We drew the words 4th of July and a few fireworks inside the circle. We then placed the drawing on our counter underneath a sheet of wax paper. Alec took turns melting Wilton candy melts in red, blue,and speckled white. As each color was melted he spooned the chocolate into a sandwich bag and snipped a bit of the corner off; piping the colored chocolate where he wanted it on his cake design. When he had everything the way he liked it we set the chocolate aside to dry and harden back up. The next day he used a piping bad and decorator tip to finish frosting the cake. Once we had everything frosted to his liking we gently moved the chocolate pieces from the waxed paper. Some of the pieces broke since the chocolate was quite thin but we pieced them back together on top of the cake and it looked amazing. He sprinkled some edible stars around the edges of the cake and declared his cake finished. Didn't he do a wonderful job!?! I can't wait to try a piece. Love it! Happy 4th of July. Thank you! Happy 4th of July to you too! 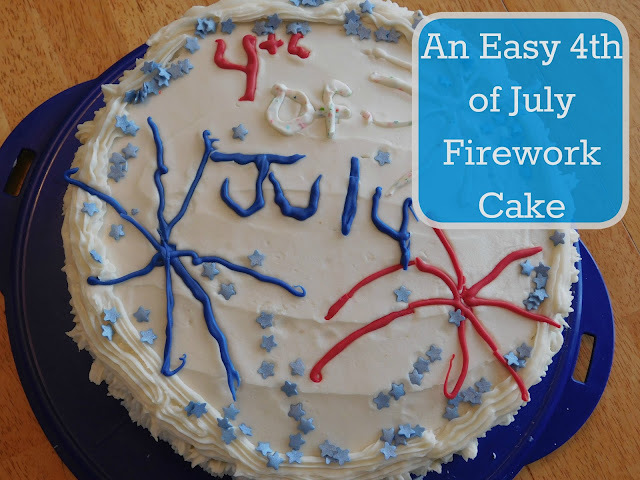 Now that's just the cutest 4th of July cake I've seen. Good job! Thank you! He is so proud of it.